Foot Levelers has teamed up with Naot, a recognized brand in comfortable footwear, to offer you a top-notch shoe with the proven support of individually designed functional orthotics. 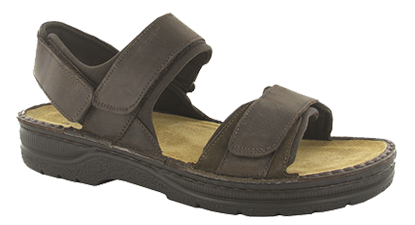 Naot sandals are a perfect fusion of style and support, providing you with ultimate comfort. 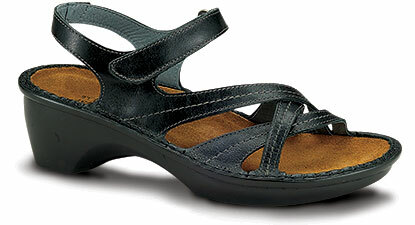 Arthur is a backstrap sandal with three Velcro straps for complete adjustability. Each strap is lined with a soft, microfibre padding for maximum comfort. The removable, anatomical cork and latex footbed is wrapped in pampering suede and molds to the shape of the foot with wear. The Men’s Scandinavian Collection features a polyurethane sole which is extremely lightweight, durable and slip resistant. 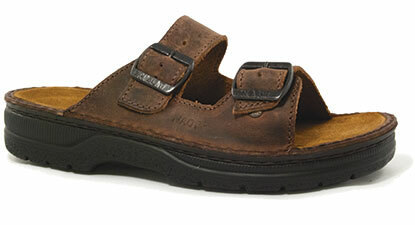 The Naot Papaya Sandalthotic comes with 2 adjustable straps, one on the heel and one at the forefoot. It has a 1.5” heel and a metal shank for additional support and durability. The custom orthotic footbed is wrapped in a comfortable and lasting microfiber. The color of the Naot Papaya is Gunmetal and the sizes are M 5-11 (whole only). 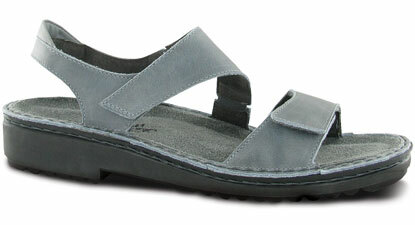 An adjustable strap, plush nubuck top cover, and a stylish look make the Naot Enid a great go-to Sandalthotic. 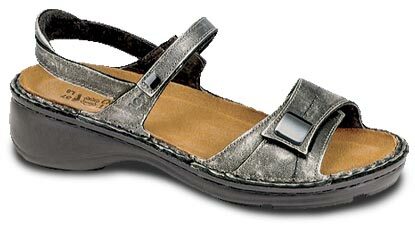 The supportive back strap allows this Sandalthotic to be worn all over town. The slip resistant outsole and wide footbed make the Enid a great selection. This classic, two-strap sandal is ideal for women who aren't afraid to push their sandals to the limit. Rugged enough for a trail hike, but feminine enough to be the envy of all her friends, the Naot Mikaela will become as hallowed as her favorite pair of worn-in jeans. This sandal is ideal for women who need a shoe they can breathe in, but want all the girly trimmings without being too dainty. The Naot Paris is the whole package with its criss-cross leather uppers and adjustable ankle strap for a custom fit. And like all Naots, the Paris is as stylish as it is comfortable.